The soundscape in shallow waters displays a high level of spatial variation due to the difference in ocean environments, biological communities, and human activities. Many marine animals rely on sound for orientation; therefore, the soundscape has been hypothesized as one of the environmental indicators for marine animals. 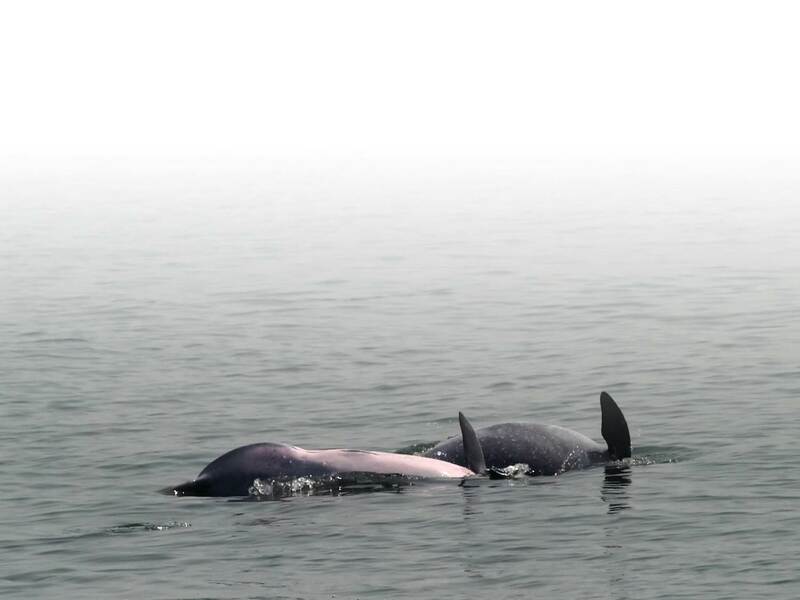 The population of Indo-Pacific humpback dolphins in western Taiwan waters is critically endangered. The anthropogenic noise might alter the marine soundscape evidently. However, the importance of soundscape for the habitat selection of cetacean remains unclear until now. In this study, underwater recorders were deployed in inshore waters to compare the difference of soundscape between the core habitat and non-core habitat of humpback dolphins. The result indicates that the composition of soundscape scene is different among our recording stations. At the core habitat, soundscape was characterized by the nighttime chorus of croakers and the quiet ambient sound in the daytime. On the contrary, snapping shrimp sounds represent the most dominated sound at the non-core habitats. The current result indicates that humpback dolphins prefer soundscape dominated by the chorus of their prey resources. The potential impacts of human activities on marine soundscape should be carefully evaluated in the future. Our new article which introduce a new method of using representative frequency distribution to classify delphinid species has been published in the Journal of Acoustical Society of America. Please contact me if you are interested in the pdf copy or the algorithm. Classification of odontocete species remains a challenging task for passive acoustic monitoring. Classifiers that have been developed use spectral features extracted from echolocation clicks and whistle contours. Most of these contour-based classifiers require complete contours to reduce measurement errors. Therefore, overlapping contours and partially detected contours in an automatic detection algorithm may increase the bias for contour-based classifiers. In this study, classification was conducted on each recording section without extracting individual contours. The local-max detector was used to extract representative frequencies of delphinid whistles and each section was divided into multiple non-overlapping fragments. Three acoustical parameters were measured from the distribution of representative frequencies in each fragment. By using the statistical features of the acoustical parameters and the percentage of overlapping whistles, correct classification rate of 70.3% was reached for the recordings of seven species (Tursiops truncatus, Delphinus delphis, Delphinus capensis, Peponocephala electra, Grampus griseus, Stenella longirostris longirostris, and Stenella attenuata) archived in MobySound.org. In addition, correct classification rate was not dramatically reduced in various simulated noise conditions. This algorithm can be employed in acoustic observatories to classify different delphinid species and facilitate future studies on the community ecology of odontocetes.